I like to add some almond flour to my mixture so that there is some nutritional value along with the sugar, but if you’re baking for a group it’s wise to list ingredients for anyone with nut allergies. You can switch to all oat flour, or use half oat flour and half King Arthur Gluten-Free mix. I used to bake exclusively with this mix, as it’s a great product, but I started looking for ways to bake that are less high-carb. If you like the taste of cardamom, please try the optional cardamom suggested in the recipe at least once! I was in a class taught by Dr. Vasant Lad when he said, “Cardamom is the antidote for chocolate.” In other words, it helps ameliorate the problems that are caused by chocolate’s qualities. This recipe doesn’t require eggs, which is a plus for many people who follow an Ayurvedic way of life and prefer to avoid eggs. And if you want to add an egg to the dough, you’ll have some additional protein to balance the carbs. If you want some added protein with your sugar, you can replace psyllium husk and water with 1 egg. Take special care to measure everything precisely and use every drop of the fat and liquid (or egg) as directed, or the cookies will be dry. You can use semi-sweet chocolate chips, although I prefer the 65 or 70 percent cocoa chips for less refined sugar. Plan your schedule so you can chill the dough for at least 30 minutes. Longer is fine. These are chewy cookies. 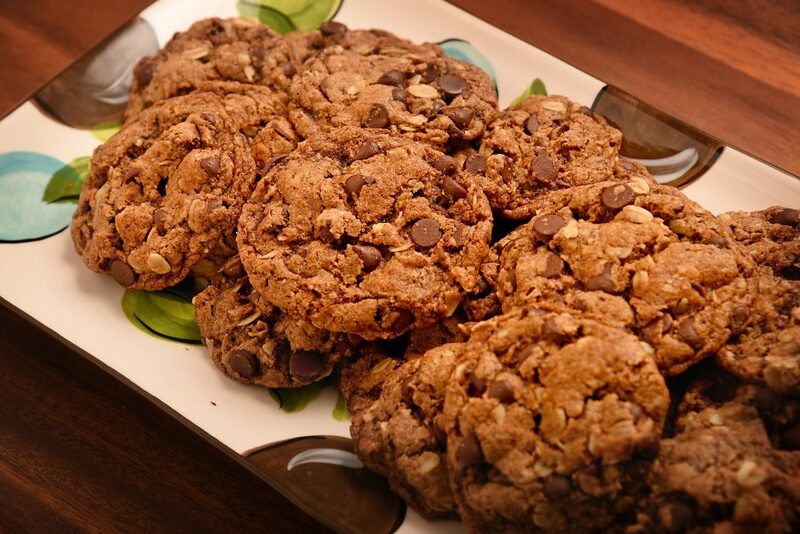 If you prefer crisp cookies, bake the cookies two minutes longer. 1. Melt ghee or coconut oil in a small sauce pan on low heat. Set aside to cool. 2. In a medium-sized bowl, whisk together flours, xanthan gum, baking soda, salt, and psyllium husk. (Omit the psyllium if you plan to use an egg). 4. Combine the ghee and sugar mixture with the flour mixture, and mix well with a spatula. Add oats and mix well. Fold in chips (and nuts, if using). Cover and chill the dough in the refrigerator for 30 minutes or longer. 5. Preheat the oven to 350˚F. Line one or two baking sheets with parchment. Use a measuring tablespoon to gather up heaping spoons of dough and drop balls on the parchment, leaving about 2 inches of space between the cookies so they can spread. Bake until the cookies start to brown, 11 to 13 minutes. Bake another minute or two if you like crispier cookies. Transfer the parchment with cookies to cooling racks to cool for at least 10 minutes, if you can wait that long. Let cool for an hour before storing in a covered container with parchment between the layers up to three days. These look really yummy. I don’t think I have gluten problems but have friends who do, so this is great to have something they can eat. OMG is right! How do I love THEEse amazing chocolate chip/cardamom cookies? Let me count the ways…. They’re the most outstanding chocolate chip cookies I have ever eaten — whether gluten-free or traditional! I can’t wait to try these! I love love love cardamom, even though my sweet mother in law insists that you can’t love food, only people! Your mother-in-law gave me a chuckle! But when we recognize food as part of the Divine, then we also understand food is worthy of our love. Those cookies are very awesome. I will have to prepare them.